Over the years I have put away thousands (approx 12,000) of business cards from people I met since I impulsively moved here in 1996. Among the many engineers, marketeers, investors, and press, only a few have stood out. Not for the CxO or MD or GP designations noted on the cards, but for the quality of the individuals that has held over time. A few days ago in a conversation with a few founders, the discussion turned to AngelList and Naval and how it was changing the landscape of innovation, financing, and startups. To the amusement of others, I recounted the very first time I met Naval. 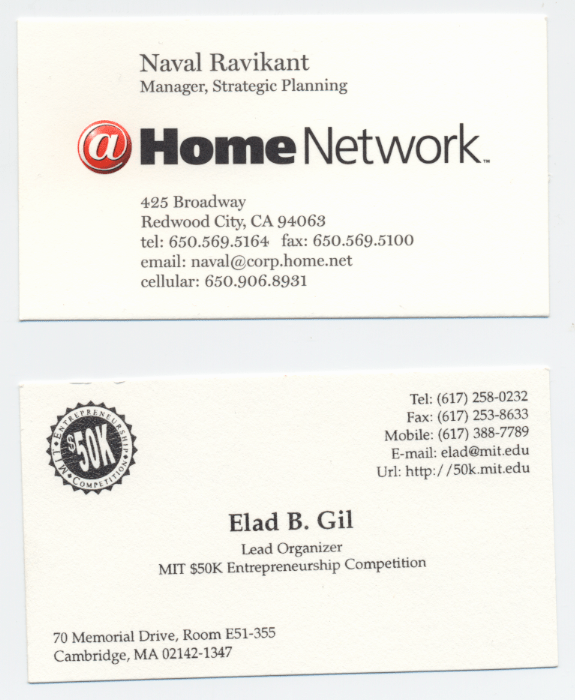 The top business card you see here is from a meeting with Naval and Milo, both of @home, in 1998 (I think) at KPCB. We had just been funded by Kleiner and MDV and this was one of the meeting our VCs arranged with a portfolio company of theirs. Milo did most of the talking I remember – about their grand plans for taking over the world through high bandwidth cable broadband. A few years later, Naval was in a meeting again with us – this time as a co-founder of Genoa making and selling semiconductor optical amplifiers. His business card had changed but he was passionate about how that device would change the network despite our concerns about Gain/Noise-figure vs. optical fiber amplifiers. Then a few years later, I heard of him again – this time in a Sand Hill boardroom regarding epinions and the legal wrangling. In 2011-2012, I joined AngelList and yes, Naval is still relevant – perhaps with more impact than ever. As I meet founders enamored with the latest valley exit still fresh in their mind, I encourage them to ask themselves a simple question – Are you relevant in ten years? How do you plan to stay relevant to yourself and to the community around you? If you haven’t thought about that yet, please consider asking yourselves the question. The other business card in the scan belongs to Elad Gil. I first met him in 2000 when he was a graduate student who had organized (w/ Pavel) the MIT $50K competition and I was honored to be the opening keynote there. Later that night, he spoke of his research, and his interests in multiple areas including devices and networks. The year after, I met him again – this time along with Gokul Rajaram – as representatives of Onetta – a smarter optical amplifier for networks. And then in 2004, at Google cafeteria where he talked of Google Mobile and how mobility is the eventual frontier for information. Now, after founding Mixer Labs and a few years at Twitter, he is planning on reinventing himself again while continuously giving back to silicon valley. Yes, a lot of people in the valley and elsewhere have stayed relevant, learnt constantly but very few have also given constantly – Naval and Elad have openly and continuously shared their learning with others around them and made everyone else a little smarter. Their impact on our valley is not just measured in dollars or exits, it is compounded through their contributions to amplifying the potential of others. This is my definition of ‘relevance’. It is not just something you do when you’re successful, it is who you are – for others – constantly. I guarantee that whatever technology or market you happen to be working on will change multiple times in your career. If you learn and help others learn, you will change too – for the better and you will still be relevant in 10, 15, 20 years – to yourself and to those around you.